The California Air Resources Board (ARB) in December 2008 adopted a new regulation to reduce greenhouse gas emissions by improving the fuel efficiency of heavy-duty tractors that pull 53-foot or longer box-type trailers. Fuel efficiency is improved through improvements in tractor and trailer aerodynamics and the use of low rolling resistance tires. The regulation is expected to reduce greenhouse gas emissions by approximately 0.7 million metric tons of carbon dioxide-equivalents by 2020, statewide. Over the 11 years between 2010, when the rule went into effect, and the end of 2020, it is estimated that truckers and trucking companies will save about $5.1 billion when diesel fuel consumption is reduced by as much as 500 million gallons in California and 3.3 billion gallons across the nation. The tractors and trailers subject to this regulation must use U.S. Environmental Protection Agency SmartWaySM certified tractors and trailers, or retrofit their existing fleet with SmartWay verified technologies. For further information, please call 866-6DIESEL (866-634-3735) or email at: 8666diesel@arb.ca.gov. Financial assistance is available through an ARB loan program and the Federal SmartWay Finance Program . More information can also be found at the federally-funded Diesel Emissions Reduction National Program (DERA). New links to SmartWay verified and designated technologies have been added to this website, including tractors, trailers, trailer aerodynamic technologies, and low rolling resistance tires. The new trailer aerodynamic technologies page provides direct links to individual product manufacturers so you can find out more information about these products. 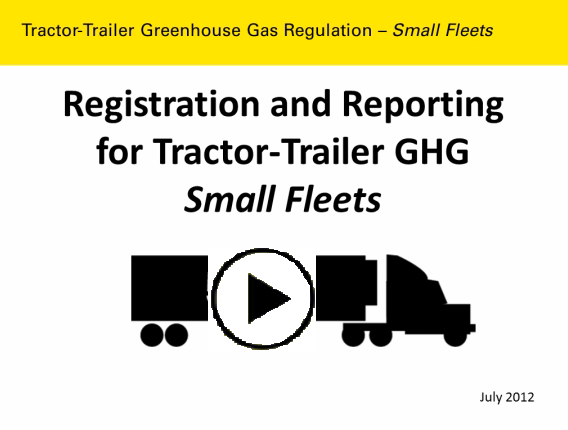 A fact sheet providing storage trailer exemption information for the Tractor-Trailer GHG regulation is now available. The California Air Resources Board (CARB) has developed a compliance tool to help truck drivers and freight shippers determine whether individual 53-foot box trailers can be legally operated in California based on whether they have been registered with CARB for an extension or an exemption to the requirements of the Tractor-Trailer Greenhouse Gas Regulation. The compliance tool can be accessed from any internet-enabled device (computers, mobile phones, tablets, etc.). The link for the compliance tool is arb.ca.gov/ghgcheck. The California Air Resources Board has issued Advisory MSC 12-26 to explain how the low rolling resistance tire requirements of the regulation will be implemented for: (1) tractors that use 2 or more open shoulder drive tires and (2) 2011 and newer model year tractors and trailers that use retreaded tires. The California Air Resources Board has posted on its website the following document: Implementation Guidance for the Tractor-Trailer GHG Regulation 1) List of Pre-Approved Modifications to SmartWay Verified Aerodynamic Equipment for Trailers, and 2) Requirements for Obtaining California Air Resources Board Approval for Modifications (Wind Tunnel Test Procedure). The California Air Resources Board has posted on its website a list of SmartWay Low Rolling Resistance tire models that are no longer verified, but can still be used in meeting the LRR tire requirements of the Tractor-Trailer Greenhouse Gas Regulation. The California Air Resources Board has issued Advisory MSC 12-19 to explain how the low rolling resistance tire requirements for 2010 and older model year tractors will be implemented. Affected tractors must use SmartWay verified tires (new or retread) by January 1, 2013. However, if a non-compliant tire was manufactured or retreaded (as determined by the U.S. Department of Transportation “DOT” date stamp on the sidewall) before January 1, 2013, the tractor may continue using it until the end of its useful tread life, or until January 1, 2015, whichever comes first. After January 1, 2015, all tires on affected tractors must be SmartWay verified, regardless of when they were manufactured.